It is Spring! Well, for some of us! 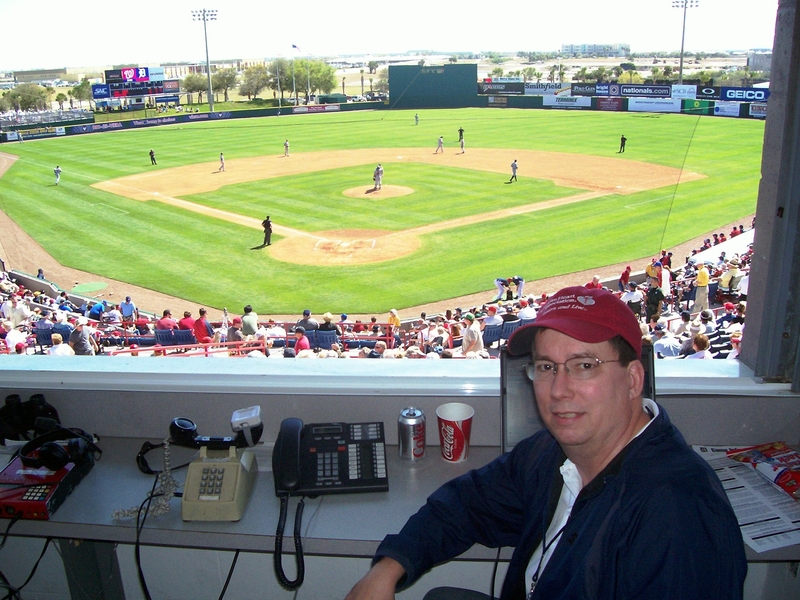 Where can one work at his computer and watch live MLB baseball in February? Answer: on the “Space Coast” of Florida! Some of you are living in the cold, some of you are caged in an office, some of you are languishing in the boredom of your jobs. I, however, am watching–by the grace of my wife (first and foremost!) and the graciousness of my brother (who works for the Nationals)–the Nationals and Tigers play the first home game of Spring training for the Nationals. The bad news is that the Cubs lost their only three postseason games this year and will not be going to the World Series. The good news is that the cosmos is stable, the economic crisis has not disturbed the fundamental mechanics of the universe, and electoral deceptions do not disrupt the fabric of the most basic truths of life. The Cubs lost–the world is as it should be. Am I sad? Not really. Oh, I would have enjoyed a Cub run through the Series to victory. I would have savored it. I am not a johnny-come-lately Cubs fan. I have been a fan since 1967 (since I was 10 years old)–the years of Billy Williams, Fergie Jenkins, Ernie Banks, Ron Santo, etc. I was a Cubs fan long before WGN went cable. So, my serenity is not disturbed by an early exit from the postseason. In fact, my serenity does not come from sports at all. If I may wax a bit theological here….are you surprised?….my theology of “play” is not about winning or distraction. It is about enjoying the moment; about taking pleasure in the gifts God has given to his world. To play–or to watch vicariously–is a kind of abandonment to the moment, to experience joy (even when we lose!). I enjoy the Cubs as a part of my “playing,” just as I enjoy other moments of “play” (from playing cards to playing with my wife). They provide moments of life, moments of joy, spontaneous moments that re-create and enliven our stories. But my serenity does not depend on winning or losing. My serenity comes from playing in the presence of God…just as the Sabbath was not simply a day of rest, but a day of enjoyment, a day to play…just as the Song of Songs was about the playfulness of sexual love between a man and woman…just as biblical hospitality is not merely an ethical obligation but a moment to play as well. So, the Cubs lost. That’s ok. God is stil God–obviously! And my abiding joy–as I continue to learn–comes from a divine presence rather a Cubs World Series victory. To despair over a loss in sports is a loss of perspective about what is truly important and from where true joy comes. Time for some “tongue-in-cheek” …. My ten reasons why the Chicago Cubs will return to the World Series for the first time since 1945 and win it for the first time since 1908. 10. The Cubs won nine straight games on the road which is something they have not done since 1945. 9. The Cubs winning percentage reached above .630 for the first time since 1945 (when they had .636). 8. The Cubs won nine straight series for the first time since 1907–a year they also won the World Series. 7. The Cubs reached 35 games above .500 this season for the first time since 1945 (not there now, however!). 5. The Cubs have the longest championship drought among professional teams in the US. 4. They are America’s team–midwestern, true blue…and America only likes winners, right? Even when they only win every 100 years. 3. The goat died a long time ago, all the black cats in Chicago have been quarantined, and Bartman will not be allowed in Wrigley this time. 2. I will not watch any more Cub games on TV since every game I have watched in its entirely or most of it they lost! When I watch, they lose. So, I won’t watch….maybe. 1. There is a benevolent God! The Red Soxs did it in 2004. After 86 years, the curse of the Bambino was finally lifted. While the Cubs have not won a World Series since 1908, their “curse” actually dates to 1945 when a goat was refused admittance to Wrigley field. 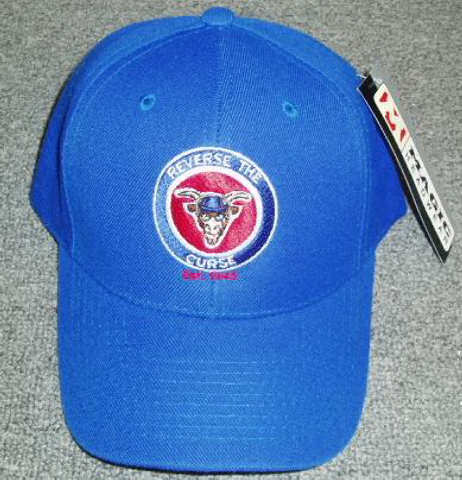 I wear my Cubs hat with great pride–“reverse the curse” with the symbol of the goat emblazed on a blue background. I wore it the other night when the Cubs blanked the Braves 8-0 at Turner Stadium. And the curse continued throughout the years…. …a routine groundball goes through the legs of dependable firstbase star Durham in 1984 and the Padres take the lead in seventh inning and win the series. …Bartman interferes with a catchable foul ball and the Cubs collaspe in 2003…instead of a 3-0 lead, they give up eight runs in that eighth inning and lose the game, and then the series the next day. It is time to reverse the curse in Cubs Nation. Redemption is nigh. The tears will be swept away. There will be no more mourning at Clark & Addison. Playful? Now that is what I am doing. There is no Goat curse. No Black Cat curse. No Bartman Curse (give the guy a break–every fan would have gone for the ball if it were right in front of him). Baseball is just a game. I find it fun; to follow the divisional races, to watch the playoffs, to enjoy the Series is diverting, exciting, and recreational….but ultimately meaningless. “Reverse the Curse” means something much more serious to me. It is the battle cry of the kingdom of God! It is the epitome of the ministry of Jesus. More to come…..
“Catch Them If You Can” — Please Don’t Say That! Why did ESPN.com do it? They headlined the Chicago Cubs with “Catch Them If You Can”! I can feel another jinx in the works. Somebody is going to show up with a goat at Wrigley and be refused a seat as in 1945. 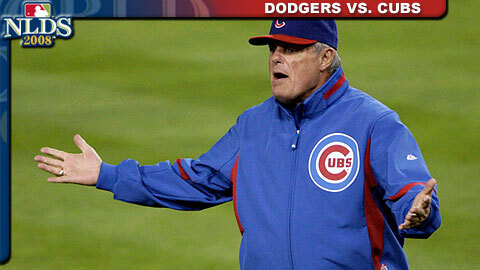 Or, there will be another Bartman. But “catch them if you can”….give me a break. It is better to be silent like we are waiting out a no hitter by not talking to the pitcher and letting him sit alone in the corner so that we don’t disturb the forces in the universe. “Catch them if you can”? These are the Chicago Cubs. They know how to blow a lead. 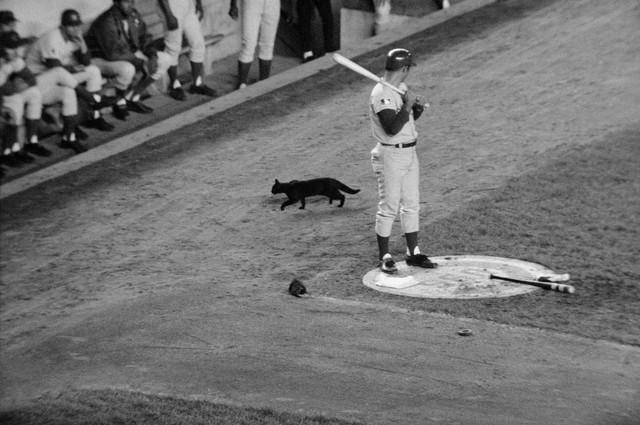 Today they are 75-47 with a 5.5 game lead over the Brewers, but on August 16 of 1969 they were 75-44 with a nine game lead…and all Cubs fans know what happened next. They lost it. They finished the season with a September record of 9-19 while the “Amazin’ Mets” went 23-7. The Mets finished eight games ahead of the Cubs in their division! The Mets went to the series instead of the Cubs after sweeping the Braves in the playoff round (just like the Cubs just sweept the Braves this week!). By the way, Lou Pinnella–now manager of the Cubs–won Rookie of the Year in 1969! Is that an omen or what? I remember the Cubs collapse like it was yesterday. I was a tender-aged twelve years old when the baseball “gods” broke my young heart that year. Am I excited this year? I’m trying not to be. I don’t want to set myself up for a fall. Low expectations may receive great reward but high expectations bring tragic disappointments. But it is hard not to be excited, especially when the Cubs keep winning and in dramatic fashion….like a three run homer in the ninth last night against Florida to extend their road winning streak to nine games. It is the longest streak since they were last in the World Series in 1945. Ok…I’m excited; I’m ready for a Cubs World Series at least once in my lifetime, and God surely has sufficient grace to give Cubs fans a World Series win every 100 years, right? 🙂 We can only hope as we Cubs fans have been doing since 1945 (their last appearance) and 1908 (their last Series victory). We may feed on the lamentable antics of the Chicago Cubs for the past 100 years, but everyone has to give us Cubs fans at least one credit — we may be misguided, but at least we are loyal! Hey, the Cubs have won more games than any other franchise in history except the San Francisco (New York) Giants…over 10,000! But, alas, no World Series since 1908.